You spent the time and money to buy or make the Halloween costumes, but they'll only be worn for a few hours, in the dark and hidden under a coat if the trick-or-treating forecast calls for cold weather. Solution? Extend the Halloween season by throwing a Halloween party for kids. Here are some suggested themes with activities and menus that complement them. This party can get messy, but it's so much fun it could become an annual tradition. Invite several families to your house, and ask them to bring their pumpkins and carving tools. Set up long tables either outside, in the garage or a rec room with the floors covered. At a designated time, guests carve their pumpkins however they please. As they scoop out the pulp, come around with a baking sheet, collect the seeds and toast them in the oven for an end-of-party treat. You could also slip the toasted seeds into small bags and send them home as favors. Once all the pumpkins are carved, display them together, perhaps giving awards for originality, precision or beauty. Besides the toasted seeds, the menu could include pumpkin soup, pumpkin cookies, pumpkin doughnuts or anything pumpkin. When it comes to decorations, stick with a harvest theme. Make a scarecrow, circle up some hay bales on the lawn for seating (draping quilts or blankets on top of the hay bales makes them more comfortable), and wrap bundles of dry cornstalks with white Christmas lights if the party is held during the evening. 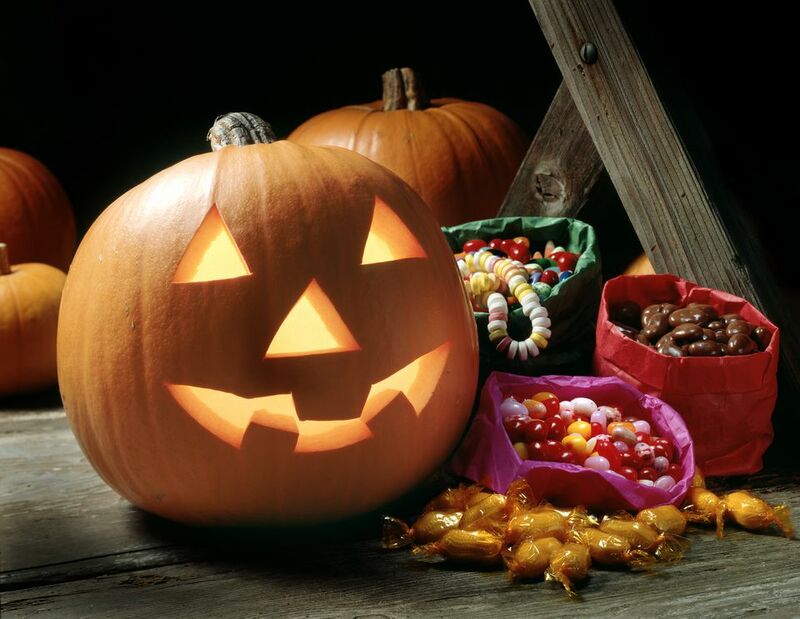 Although they can be little tricksters and are as sweet as treats, children aren't born knowing how to trick-or-treat. Little ones need some coaching, and a fun way to do that is to set up a mock neighborhood in your house sometime before Halloween. Borrow indoor playhouses from friends or have the kids make houses from large cardboard boxes. Place each house in a different room and station an older child inside with a bowl of candy, stickers or other small prizes. The young kids then knock on each door and practice saying "trick or treat" and "thank you." The little ones get the thrill of receiving treats, and the older kids feel a sense of pride for helping the tots. There'll be plenty of sugar in the candy, so you won't need to make dessert. For the main meal, serve Halloween Tossed Salad, Boneyard Chicken Drumsticks or Deviled Ghoul Eggs. Avoid gory decorations (think pumpkins, not zombies), since this is a party for young children. Who doesn't remember a Halloween when you couldn't find your treasured trick-or-treat bag, so you used an empty pillowcase at the last minute? You can solve that problem by hosting a bag-making bash a week or so before Halloween. Depending on the age of your guests, the bags could be as simple as making handprint ghosts or decorating treat buckets or as sophisticated as sewing up scrappy owl sacks. If your project involves using a pre-made bag, you could start the party by serving the kids their meal in the sack. Once they're done eating, announce that they'll then turn those bags into their very own trick-or-treat carriers. The food could include ghost-shaped tuna salad sandwiches, barbecue "worm" sandwiches or witches' brooms, which are made from pretzel sticks and fringed fruit leather. A glass bowl of nuclear waste punch with glow sticks placed underneath it is sure to get some oohs and aahs from the kids. Older children can follow most of the how-to steps on their own, but if the party is for young children, it's best to have the supplies cut out and well organized ahead of time. Be careful not to get too involved, though. Their finished products might not be as refined as something you could buy in a store, but they'll carry them with pride on Halloween night since they made them themselves. For decorations, stick with the sack theme by lining the walkway to your front door with paper-bag luminaries and hanging ghosts made out of white trash bags from a tree. If you long for the Halloweens of yore, host an old-school party. Bob for apples, race to eat donuts hanging from string or play other classic party games. Show a favorite Halloween movie under the stars, such as It's The Great Pumpkin, Charlie Brown (compare prices) or another kid-friendly Halloween flick. Set up an outdoor cinema complete with hay-bale seating and propane space heaters. Better yet, turn out the lights, burn some spice-scented candles and have a grown-up read scary stories to the kids. Set the party's vintage tone with invitations and decorations. Your local antique store might sell old Halloween cards, which you could photocopy or scan into your computer and use to make your invitations, placemats, napkin rings, garland or other decorations. However, you choose to celebrate Halloween, be safe and have fun.